BDI-BioEnergy International AG has been commissioned to build a multifeedstock biodiesel plant in the port of the French city of Le Havre. The order volume amounts to $20 million. Feedstock will include nonfood-grade fats and used cooking oil. Ultra Green Energy Services says its Brookhaven Rail Terminal operations will make biodiesel more available across Long Island and supply fuel for the New York City Bioheat mandate that goes into effect this October. A July 19 celebration is planned. W2 Energy Inc. announced it is in the final stages of completion for its recently acquired biodiesel plant. 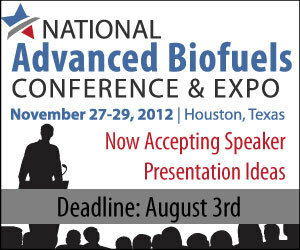 W2 Energy recently purchased a fully operating turn-key biodiesel plant from Agri-Green Biodiesel Inc. Start-up is targeted for Aug. 1. Having demonstrated its cost-effective catalytic process for making jet fuel, diesel and gasoline from renewable plant oils or animal fats, AliphaJet is beginning its commercial scale-up program. It plans completing a 500,000 gpy plant in one year. Following the Senate passage of its version of the Farm Bill, the House of Representatives released its own initial draft of the bill July 5, scheduled for mark-up this week. It authorizes $2 million a year for the Biodiesel Fuel Education Program. On July 11 the U.S. House Subcommittee on Oversight and Investigations will hold a hearing on "RIN Fraud: EPA's Efforts to Ensure Market Integrity in the Renewable Fuels Program." The hearing will continue the committee's investigation into EPA. Dublin-based Research and Markets has announced the addition of the "Biofuel Consumption in the United States" report to its offering. It contains descriptions of leading players including key financial metrics and analysis of competitive pressures. Pacific Biodiesel Technologies unveiled its newest project and the first biofuel refinery to be built in the state since 2000, Big Island Biodiesel. It has been 12 years since Pacific Biodiesel conceptualized and began operations at Sand Island.